Hello—We have just moved to Texas. We are a bit concerned, as we constantly find spiders in and around our pool and in our kitchen. We have attached some photographs (Editor’s comment: the photo and its enlargement, shown on this page, were taken in the correspondent’s kitchen). Could you please help us identify them? Are they poisonous or dangerous? How can we get rid of them? Thanks and best regards—Ralph E.
Ralph’s spider is–based on even a superficial analysis of its gross anatomical characteristics–clearly a recluse spider in the Sicariidae family. More than likely, it is a brown recluse (Loxosceles reclusa), though to be absolutely certain, we’d have to process its DNA to the molecular level. Obviously, that is impossible to do from a photograph, and inasmuch as Ralph E. has not replied to my request for physical specimens of his spider(s), this one photograph will simply have to do. The absence of remarkably distinguishable eyes suggest this is not the typical brown recluse, whose eyes are generally quite noticeable. Over the past few years I’ve observed several recluse specimens like this one, whose eyes are diminished in size and coloration (typically amber, clear, light green, or bluish) to the point that they are very difficult–if not impossible–to see. 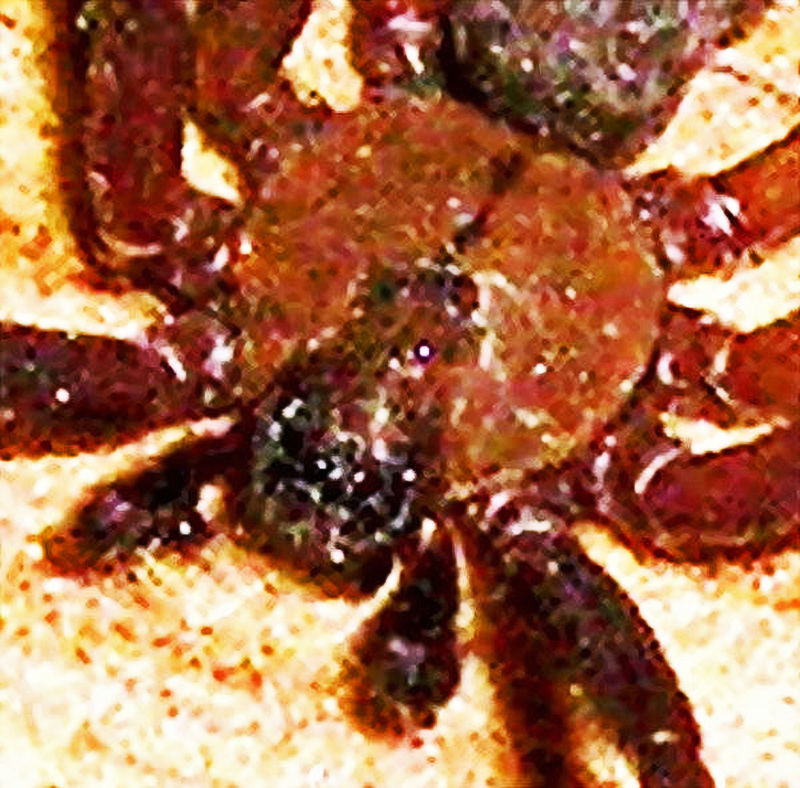 One in particular, collected near Lake Travis, Texas, appears to have reduced eyes that suggest that spider is a troglophile, inhabiting the karst limestone caves in that locality. Others, like one collected in Collin County, Texas, has eyes that appear of intermediate size between the typical brown recluse, whose eyes are quite noticeable, and those that seem dramatically reduced. Parks, et al., (2006) studied the means used by brown recluse spiders to size up their prey (specifically, in that study, short-horned grasshoppers), and from her notes it appears that eyesight plays an inferior–if not essentially unnecessary–role in the process. Being primarily nocturnal, attacking and immobilizing prey calls more on tactile faculties than on ocular ones, so near-total blindness would not seem to pose a severe impediment. The only need for “eyes” would be to distinguish between lighted and darkened areas, as a means of avoiding the former while favoring the latter. An animal does not need much in the way of ordinary eyesight for that, certainly nothing that would be easily recognized as eyes on a photograph. I’ve speculated on why certain specimens of recluse spiders might have remarkably diminished ocular faculties, but without doing further field studies such speculations are no more than the ruminations of a curious mind. Presently those speculations focus on the possibility that these recluse spiders have evolved reduced eyes in caverns or similar locales where light is either nonexistent or very faint. One specimen collected in Central Texas is particularly suggestive of this possibility, merely because of the obvious presence of multiple underground caverns nearby and the rarity with which recluse spiders are presently found out in the open in those locales, but as mentioned earlier considerable field research will be necessary to pursue that theory further. 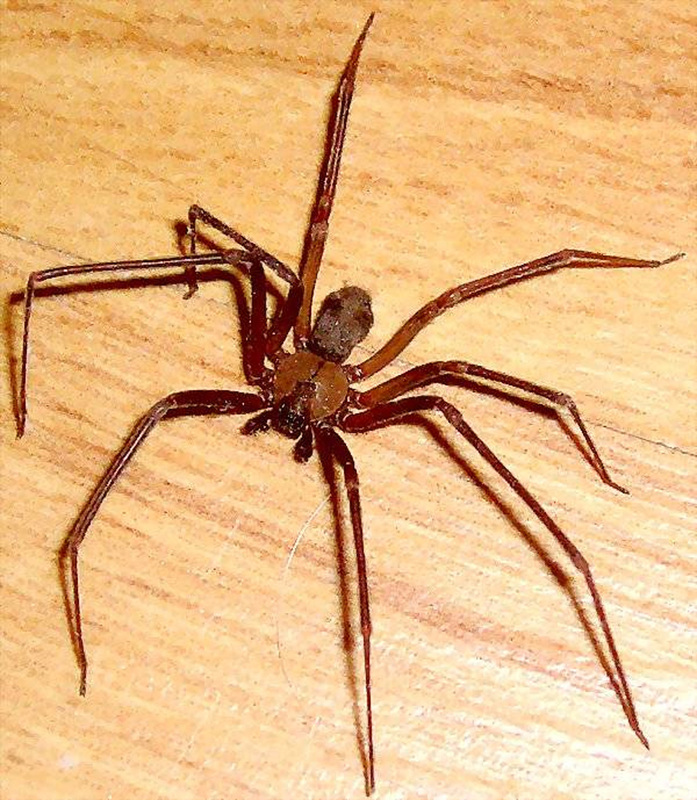 Many mistaken identifications of “brown recluse spiders” occur annually throughout the United States. These mistaken i.d.’s are almost always in the form of false positives, wherein a non-recluse spider is wrongly identified as a brown recluse. It is not unusual for me to receive photos of brown spiders that the sender is convinced are of a brown recluse simply because the spider has a brown coloration. It happens, however, that perhaps as much as 75% (these figures are only educated guesstimates) of the spiders found in homes are brown, and the vast majority of them are not brown recluses. In fact, most of the brown spiders found in homes are essentially harmless, and are beneficial predators of insects and other spiders. Obviously, then, coloration alone is no reason to become alarmed when seeing a brown spider. Others proceed one more step, concluding that their spider is a brown recluse because the marking on the carapace (the cephalothorax, or frontal half of the spider’s body, depicted in the photo that follows later in this post) bears a vague resemblance to a violin or fiddle. Again, many of our brown spiders have vague markings of this nature on their “backs”, yet are not brown recluses. One of these, the essentially harmless southern house spider (Kukulcania hibernalis), is commonly found in homes, and the males–which are colored a light brown (the females are dark brown to the point of appearing black)–often wander about looking for mates. Thus, just noticing a marking on the spider that appears to mimic the design of a fiddle or violin is not sufficient proof that the spider is a brown recluse. Fortunately, several very positive and unique anatomical characteristics are found on the brown recluse that enable practically everyone to identify them using either the naked eye or a 10x hand lens. Those characteristics are described in more detail below. (1) six eyes in three pairs that face forward, left, and right; (2) the head near the eyes is dark in color; (3) the abdomen is tan or brown, with no markings; (4) the legs have no spines. Our specimen clearly meets three of these four. Based on my experiences, it seems prudent to add a fifth anatomical feature to Vetter’s list: (5) the carapace of a recluse spider is remarkably flat, similar to the flat, disk-like carapace of a salt-water crab. Few other spiders have such a carapace. Add to that the existence of a prominent anterior protuberance for the head, bordered on each side by a vague cephalic groove whose posterior juncture meets at a well-defined, longitudinal thoracic groove (the neck of the “fiddle”) that extends thence to the posterior margin of the thorax. The cephalic protuberance of a recluse spider is also marked with a number (generally seven) of longitudinal lines. Any spider with these features, including especially the last three of the four features cited by Rick Vetter, plus the fifth one mentioned above, is almost certainly a recluse spider. Ralph E.’s specimen meets that criteria handily. We also know this is a male. Note that the pedipalps (the short leg-like structures projecting forward, from each side of the head) of this specimen are swollen at their ends. The female’s pedipalps are slender, without enlarged ends, but those of the male have this appearance due to the presence of a specialized structure (the embolus) in the extremity of each palp that is used to transfer sperm during mating. Ralph asked how to get rid of these spiders. The answer is somewhat complicated by spider biology in general, and brown recluse spider biology in particular. Spiders are not as susceptible to residual pesticides as insects. For one thing, they feed mostly on live prey, typically avoiding dead ones killed by–and therefore contaminated with–pesticides that might affect them secondarily. Although recluse spiders may be an exception to this rule, inasmuch as some evidence exists that they are scavengers (as reported by J. S. Sandidge, University of Kansas, in a seminal paper on the subject published in the journal Nature, in 2003), I am not aware that they have ever been eradicated as a result of using traditional pesticides to contaminate their prey. On the contrary, the evidence suggests that traditional pesticides, in all their forms, tend to provide an ineffective means of dealing with brown recluse spider infestations. No traditional pest management chemicals or toxicants are known to be routinely effective against recluse spider infestations in residences. The proof of that assertion is this: even after regularly spraying a home infested with brown recluse spiders with every kind of pesticide available for use in residential homes, the infestation remains. Some of the spiders die, evidently as a result of direct applications of contact sprays, and their dead bodies are found in the places where such spiders tend to hide; their numbers may even diminish for a short period of time; in cases where the pesticide tends to produce strongly repellent effects, the spiders may even begin to congregate in larger than normal numbers in places where the pesticide had not been used; but within a short period of time the infestation rebounds in all the usual places, with spiders showing up as free running specimens as well as in sticky trap monitors. J. S. Sandidge, mentioned above, has–with some of his colleagues at the University of Kansas–thoroughly studied the use of pesticides as a means of eradicating brown recluse spiders. He at one point speculated that using pesticides to deal with brown recluse infestations might benefit the brown recluse, inasmuch as they produce abundant dead prey that the spiders are able to safely feed on without the need to attack and immobilize first. Due to the legendary inability of traditional pesticides to consistently resolve brown recluse infestations, it is seems lilely that anyone with such an infestation might be wise to focus, instead, on the use of alternative, least-toxic products and methods to modify the range of habitats in the infested home. Such products and methods work well as a means of creating an environment that neither nurtures nor attracts brown recluse spiders. In the process, eliminating brown recluse infestations from residential dwellings could become a reality. Carrel, James E., and R.D. Heathcote, 1976. Heart Rate in Spiders: Influence of Body Size and Foraging Energetics. Science, 193: 148-150. Cramer, Kenneth L., 2008. Are Brown Recluse Spiders, Loxosceles reclusa (Araneae, Sicariidae) scavengers? The influence of predator satiation, prey size, and prey quality. J. Arachnology 36:140-144. Cramer, Kenneth L., Alex V. Maywright, 2008. Cold temperature tolerance and distribution of the brown recluse spider Loxosceles reclusa (Araneae, Sicariidae) in Illinois. J. Arachnology 36:136-139. Gertsch, Willis J., 1958. The Spider Genus Loxosceles in North America, Central America, and the West Indies. AMNH Novitates 1907: 1-46. Gertsch, Willis J., 1979. American Spiders, 2nd Edition. Von Nostrand Reinhold Company. Gertsch, Willis J., Franklin Ennik, 1983. The Spider Genus Loxosceles in North America, Central America, and the West Indies (Araneae, Loxoscelidae). Bull. AMNH 175: 254-360. Guarisco, Hank, 1999. House Spiders of Kansas. J. Arachnology 27:217-221. Hite, J.M., W.J. Gladney, J.L. Lancaster & W.H. Whitcomb, 1966. The biology of the brown recluse spider. University of Arkansas, Fayetteville. Agricultural Experiment Station Bulletin No. 711. Hogan, Christopher J., Katie C. Barbaro, Ken Winkel, 2004. Loxoscelism: Old Obstacles, New Directions. J. Annemergmed 08: 608-624. Parks, Jennifer, William V. Stoecker, Charles Kristensen, 2006. Observations on Loxosceles reclusa (Araneae, Sicariidae) feeding on short-horned grasshoppers. J. Arachnology 34:221-226. Sandidge, Jamél S., 2009. Brown Recluse Spiders: A knowledge based guide to control and elimination. Pubkished by BRS Pest Control, McLouth, KS. Ubick, D., P. Paquin, P.E. Cusing and V. Roth, editors, 2005. Spiders of North America. Published by the American Arachnological Society. Vetter, Richard S., 2008. Spiders of the genus Loxosceles (Araneae, Sicariidae): a review of biological, medical and psychological aspects regarding envenomation. J. Arachnology 36:150-163. — BugsInTheNews is a VIEWER-PARTICIPANT WEBSITE. Questions? Corrections? Comments? BUG ME RIGHT NOW! Telephone Jerry directly at 512-331-1111, or e-mail jerry.cates@bugsinthenews.info. You may also register, log in, and leave a detailed comment in the space provided below. Why doesn’t spraying kill off the food and eventually reduce the amount of these Spiders in your home? Also why doesn’t a bug bomb work for these?